Don’t you just love when the crisp Fall air begins to settle in and it is apple picking time? There is nothing like eating a fresh apple right off of the tree. Not only are apples tasty, but apple picking involves many sensory experiences for children including gross motor, fine motor, oral motor, and visual perceptual skills. This FREE PRINTABLE Apple gross motor activity helps children to increase their daily physical activity. This free activity is from the complete Apple Sensory Motor Packet. This free acrostic apple poem is an excellent brain break in the classroom or a movement literacy activity. The object is to complete each apple gross motor activity that starts with the letters in the word A-P-P-L-E. 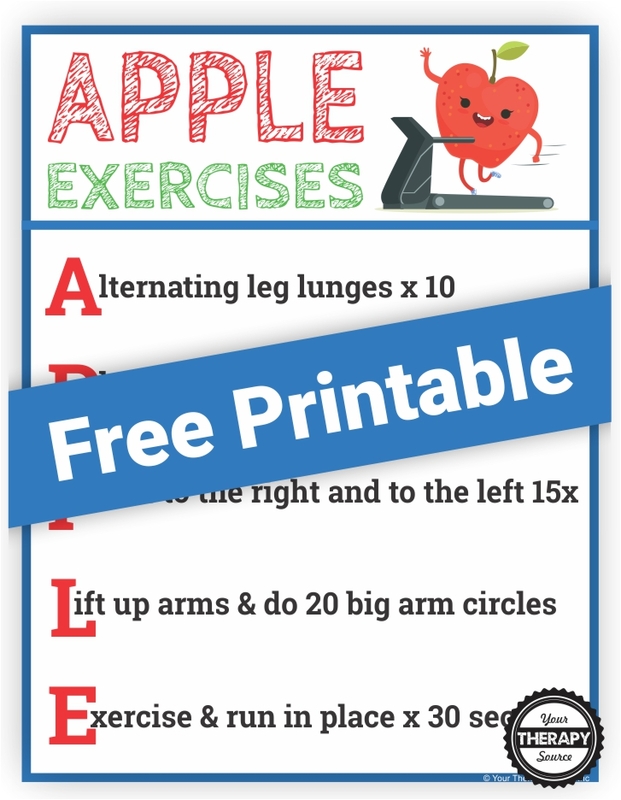 When you sign up to receive the weekly email newsletters and announcements from Your Therapy Source you will be redirected to the FREE Apple Exercise printable. 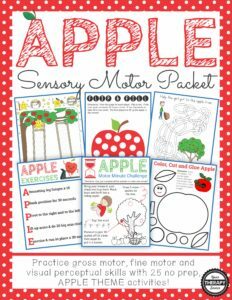 This NO PREP Apple Sensory Motor packet is sure to entertain the children while practicing different fine motor, gross motor, and visual perceptual skills. Looking for more themed sensory motor activities?